The Send To Kindle extension for Google Chrome and Chromium offers a straightforward way to transfer Web content to the Kindle reader without leaving the convenience of the Google Chrome browser (it works with Chromium, too). Once installed, the extension allows you to send the currently viewed Web page as nicely formatted text to your @kindle.com address, which automatically pushes the content to your Kindle reader. The extension also lets you send pages to your @free.kindle.com address, so you don't have to pay wireless delivery charges. In this case, the converted .azw file will be sent to the email address associated with your Amazon account, and you have to manually transfer the file to your Kindle via USB. 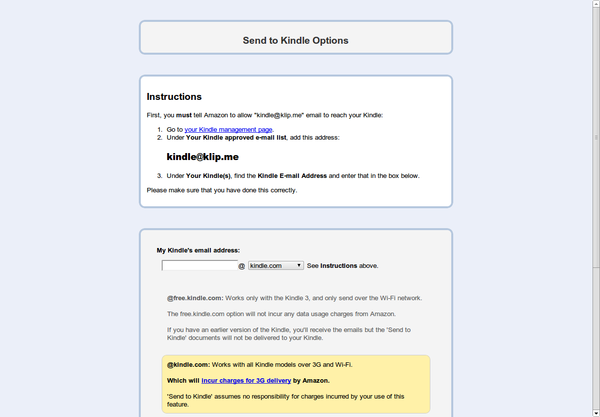 To make the extension work, you need to specify your @kindle.com or @free.kindle.com address and add kindle@klip.me to the list of approved email addresses on the Manage Your Kindle page at Amazon. Once you've done that, you can push content to your Kindle using either the dedicated button or the Alt+Ctrl+K keyboard shortcut. I would as just use PDFit for Firefox and save the web page as it really looks and then use it on the kindle.